We are what we pretend to be. Am I allowed to say that? I keep an unorganized mental log. I have vivid memories, especially of the emotionally-charged moments. Rebekah had velamentous cord insertion (cord attached to amniotic sac instead of placenta). Because of her abnormal cord attachment, she had IUGR (intrauterine growth restriction), and she was also SGA (small for gestational age). Tiny and perfect to me. She has had some health setbacks, but she faces them with the sweetest temperament. They don’t subtract one ounce from her perfection to me. 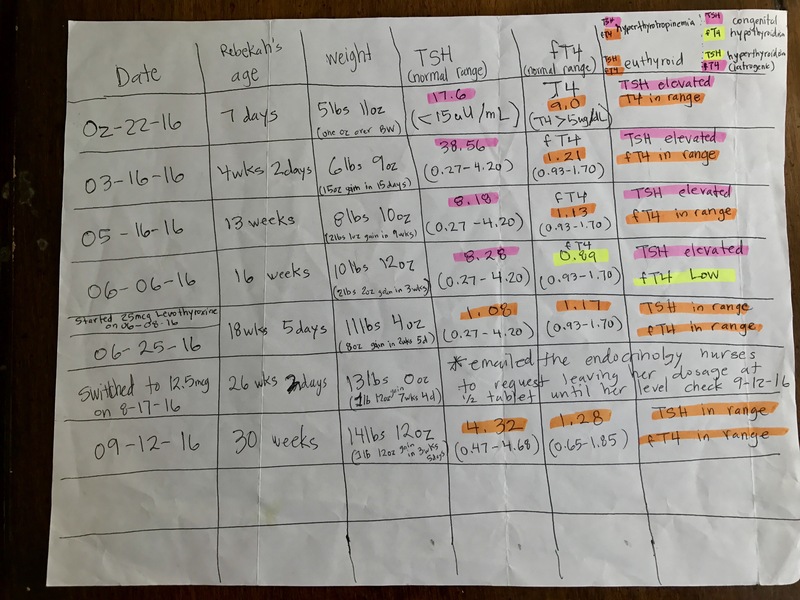 Rebekah had abnormal thyroid levels (elevated TSH) at 1 week old, 4 weeks old, 13 weeks old, and 16 weeks old. But because her thyroxine was always in range, and because I had read extensively about the differences in the hormonal profiles of SGA babies…we waited. We chose not to start Levothyroxine until she was 16 weeks old. Rebekah lost 9oz of weight between week 5 to week 8. My milk supply was low, and I had to fight hard to continue breastfeeding, something I never had to do with my other 4 daughters. I tried fenugreek, pumping, coconut oil, lactation cookies with Brewer’s yeast, ground flax, tons of water, chia seeds, coconut water…you name it. And when she was 10 weeks, and had gained her 9oz back on only breast milk, I finally started supplementing with goat milk. I would still pump daily as well. I did feel that she was doing well with all her milestones without starting Levothyroxine , but we agreed to start it when she was 16 weeks old. I put all her thyroid level results on this paper, including the lab ranges which are different. We crush her pill between two spoons, every morning. We mix it with about an ounce of apple juice or water. We read in the drug’s instructions to take it on an empty stomach. This is quite a feat with an infant. For the first 3 weeks, we would feed her at 9pm; she would wake herself around 12am to eat; then we were waking her at 3am to eat, then waking her again at 5am for her med, and then she would wake at 6am ready to eat again. Then on June 30, when we met her endocrinologist for the first time, she told us she tells her parents they can just give it with a feeding. Well hallelujah. So then we would just let her wake us. Rebekah developed torticollis (her head leaning right) almost immediately after starting Levothyroxine. I looked up anything I could to find out if there was a connection. I only found that muscle aches were sometimes a drug side effect. So we decided they weren’t connected. 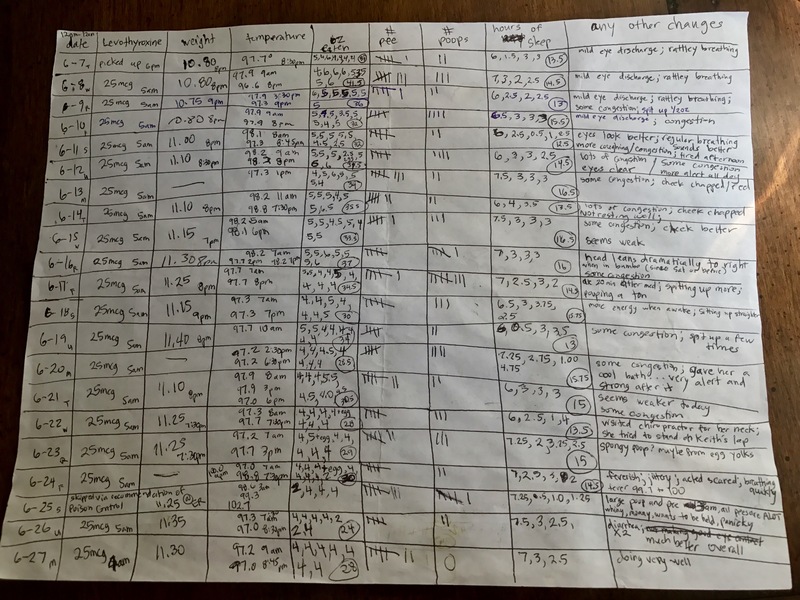 On June 12, when Rebekah was about 16 weeks old, I started making a more complicated formula that I got from Dr. Axe’s website–goat kefir, coconut water, flax oil, nutritional yeast. It seemed that her torticollis was worst when she was sleepy and/or had a full belly. Rebekah had what seemed like a panic attack on June 24. It was incredibly scary. She had a mild fever, shifty eyes, very quick breathing and a fast heart rate. I guess I deleted the videos from that night. I wish I could delete my memories of it. She ended up falling asleep that night, but then her fever continued the next day. I called the on-call nurse at AR Children’s; they recommended I call poison control. The poison control guy recommended I not give her any more Levothyroxine until her thyroid levels were checked. This was all on a Saturday, so that means I spent about an hour at a walkin (after calling to find out if they check thyroid levels, and verifying with AR Children’s that I could use them), only to have the walkin Dr check her vitals and recommend that we go to the emergency room instead. I spent about 5 hours in the ER with her–rectal temp 102.7, heart rate 185, 36 breaths a minute. This is my 5th child, so I realize these aren’t alarming vitals by themselves. But I was concerned about her behavior; the poison control guy wanted her checked out; the walkin Dr wanted her taken to ER, and her whole life has been so drastically different than my other girls. They did a chest xray, a port in her foot (which ended up being unusable), drew blood, did a catheter, drew blood again. Everyone was incredibly kind, but the experience was sooo traumatic. But mostly…we waited and waited and waited. Her thyroid levels came back in range. She was diagnosed with a UTI; they said her behavior was “normal” febrile seizures. She was prescribed Cephalexin…and we all went home exhausted. Rebekah woke several times at night, and she would have a completely soaked diaper 3-4 times a night, so soaked that they would soak her outfit and sheets every time. If you’ve followed any of Rebekah’s story and you thought to yourself–that baby needs drugs! Well, I’m sure you were relieved when we started her on Levothyroxine, but if I’m completely honest, she has faced her biggest health challenges and scares right after she started and the entire time she was on 25mcg of Levothyroxine. I can’t say, and I’m not saying that the med CAUSED her torticollis, insomnia, panic attack, excessive urine, her UTI. But I am saying it’s been rough. Rough on her. Rough on us. Rebekah started seeing a chiropractor on June 22, and her torticollis was better almost immediately. Rebekah rolled over around 5 months, and in many ways she was adjusting her her dosage and doing okay. However, she still woke several times a night with soaking wet diapers, and she was not gaining much despite her large calorie intake. On Wednesday August 17, I decided to start giving her only a half dose for a few days to see if it changed her naps and sleep quality overall, her excessive urine output…etc. I contacted the endocrinology nurses; they consulted her Endocrinologist, and she said we could leave it at a half tablet until September 12 when she had her levels checked again. And then we would go from there. Her sleep quality improved overnight; she only had to be changed once at night now (instead of 3-4 times); she has started keeping her weight on, and her energy levels improved as well. I hoped her levels would “agree” with her behaviors. Rebekah sat up on her own for the first time ever on August 19. She’s been more talkative and active, and also…more peaceful and restful at night and nap times. On September 12, Rebekah’s TSH was 4.32 (in range) and her fT4 was 1.28 (also in range). Her endocrinologist said she can stay at 12.5mcg until her level check on December 12. Depending on her levels in December, the endocrinologist said that we might talk about stopping the med entirely by Rebekah’s first birthday.